Continuing in a re-occurring series of posts showing my limited understanding of Clojure, today we’re using Clojure for log processing. This example is culled from some work I’m doing right now in the day job – we needed to extract usage information to better understand how the system is performing. 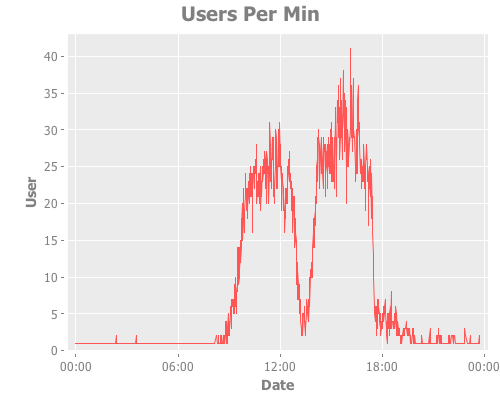 We have an Apache-style access log showing hits our site. 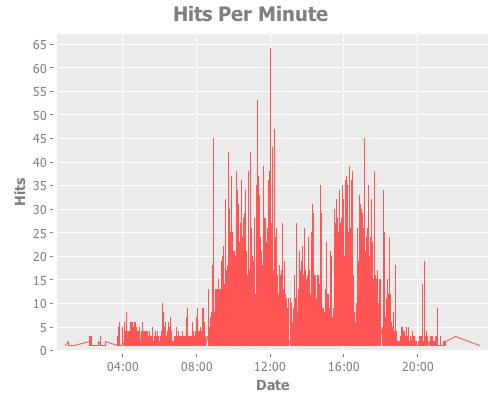 We want to process this information to extract information like peak hits per minute, and perhaps eventually more detailed information like the nature of the request, response time etc. 43.124.137.100 - username 05/Aug/2010:17:27:24 +0100 "GET /some/url HTTP/1.1" 200 24 "http://some.refering.domain/" "Mozilla/5.0 (Windows; U; Windows NT 5.1; en-GB; rv:1.9.0.9) Gecko/2009040821 Firefox/3.0.9 (.NET CLR 3.5.30729)"
We want to use Incanter to help us process the data & graph it. 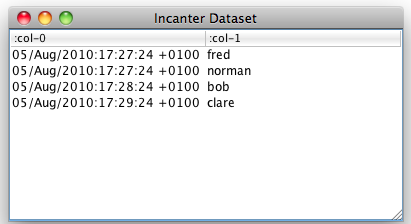 Incanter likes its data as a sequence of sequences – so that’s what we’ll create. First up – processing a single line. I TDD’d this solution, but have excluded the tests from the source listing for brevity. A few things to note. extract-records-from-line is matching more than strictly needed – I just wanted to indicate the use of destructing for matching parts of the log line. I’m pulling in the username & date – the username is not strictly needed for what follows. Secondly, note the use of read-lines from clojure.contrib.duck-streams – rather than slurp, read-lines is lazy. We’ll have to process the whole file at some point, but it’s a good idea to look to use lazy functions where possible. At this point, running records-from-access-log gives us our sequence of sequences – next up, pulling it into Incanter. 56.24.137.230 - fred 05/Aug/2010:17:27:24 +0100 "GET /some/url HTTP/1.1" 200 24 "http://some.refering.domain/" "SomeUserAgent"
12.14.137.140 - norman 05/Aug/2010:17:27:24 +0100 "GET /some/url HTTP/1.1" 200 24 "http://some.refering.domain/" "SomeUserAgent"
42.1.137.110 - bob 05/Aug/2010:17:28:24 +0100 "GET /some/url HTTP/1.1" 200 24 "http://some.refering.domain/" "SomeUserAgent"
143.124.1.50 - clare 05/Aug/2010:17:29:24 +0100 "GET /some/url HTTP/1.1" 200 24 "http://some.refering.domain/" "SomeUserAgent"
At this point you can see that it would be easy for us to pull in the URL, response code or other data rather than the username from the log – all we’d need to do is change extract-records-from-line and update the column names. While the date parsing should be pretty straightforward to understand, there are a few interesting things going on with the Incanter code that we should dwell on briefly. The $ function extracts a named column, whereas the $map function runs another function over the named column from the dataset, returning the modified column (pretty familiar if you’ve used map). conj-cols then takes these resulting sequences to create our final dataset. Next, we need to create a new function to round our date & time to the nearest minute. $rollup applies a summary function to a given column (in our case “Hits”), using another function to determine the parameters for that function (“Date” in our case). :sum here is a built-in Incanter function, but we could provide our own. You can grab the final code here. 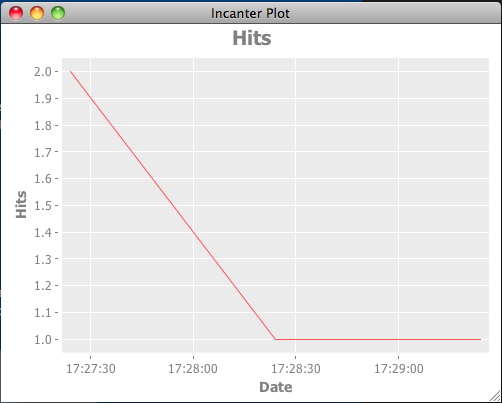 Incanter is much more than simply a way of graphing data. This (somewhat) brief example shows you how to get log data into an Incanter-frendly format – what you want to do with it then is up to you. I may well explore other aspects of Incanter in further posts. I’ve recently been working on a Clojure application that I hope to open source soon. It’s been my first experience of using Clojure, and is almost certainly one of the most thought provking things I’ve done in a long while. One of the things that is still causing me issues is how to go about TDDing Clojure applications – or rather functional programs in general. My natural inclination – for many reasons – is to use TDD as my process of choice for developing my code. Beyond its use as a design tool, it’s having a saftey net to catch me if I screw something up. It allows me to be a little more brave, and drastically reduces the cycle between changing some code and being happy that it works. I’m used to that saftey net – I feel lost without it. Stuart Halloway said during his Clojure talk at Qcon SF that despite being a TDD fan he finds it hard to TDD in a new language, and I get exactly what he means. A big part of it is that you’re getting to grips with the idioms, capabilities, libraries and tools associated with your new language – and a lack of this knowledge is going to impact on your ability to write good tests, let alone worry about implementing them. Typically, when learning a new language I try and write a small application that has a real world need. BigVisibleWall was my attempt to learn Scala – but it had a real goal. With BigVisibleWall, as with my current Clojure project, I started by implementing the system by just writing the production code. I’m pushing the limits of my knowledge constantly, attempting to understand the size and shape of the solution space that I find myself in with this new tool. Once I got BigVisibleWall working with a small set of features, I broke it down and rewrote it TDD style – at that point, I had enough Scala (and I mean *just* enough) to be able to do this without it feeling like I was wading through treacle. I consciously decided to follow the same pattern with my Clojure project. Code the main logic, get it running, then break it down and rewrite it piece by piece using TDD. But then I hit a problem – Scala and Java are similar enough languages that my programming style didn’t have to change much from one to the other. Therefore the way I structured the code and thought about TDD didn’t have to shift much. In both cases I was driving the design of an Object Oriented system. With Clojure though it wasn’t just the language which was different, it was so many of the underlying concepts were different. Put simply, I really don’t know where to begin. My first instinct is to start decomposing functions, passing in stubs to the functions under test. But this just feels like I’m trying to shoehorn IOC-type patterns into a functional program. But what am I left with – testing large combinations of functions? That feels wrong too. So what about you lot out there in blogland? Any other OO types trying to make the switch and encountering the same issues? Or any FP practitioners for whom TDD is second nature? Or does TDD just not fit with FP after all? I’m currently working on a personal project by way of learning Clojure – it’s actually a program to match up my itemised phone bill against my list of contacts to help me expense my calls. I find it best to have a real-world problem I need to solve to learn a new programming language. The problem itself is rather dull, but it did give me a chance to consider an issue I’ve hit with many other languages.